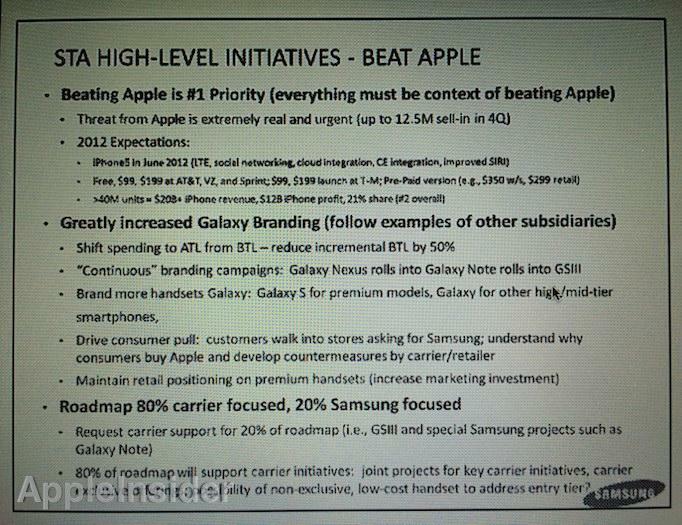 "Beating Apple is #1 Priority"
An internal document obtained by AppleInsider detailing Samsung's "lessons learned" in 2011 and its business forecast for 2012 (involved in the second Apple vs. Samsung trial this week) outlines that not only did Samsung see "Beating Apple is #1 Priority" but also that "everything must be context of beating Apple." For 2012, Samsung outlined expectations that Apple's upcoming iPhone 5 would appear in June 2012, featuring "LTE, social networking, cloud integration, CE integration, improved SIRI." The document noted Apple's competitive pricing and predicted Apple would sell ">40M units = $20B+ iPhone revenue, $12B iPhone profit, 21% share (#2 overall)." Apple went on to sell 150 million phones in fiscal 2013 after it launched iPhone 5 in September (two weeks before the fiscal year began); most of those sales were iPhone 5. 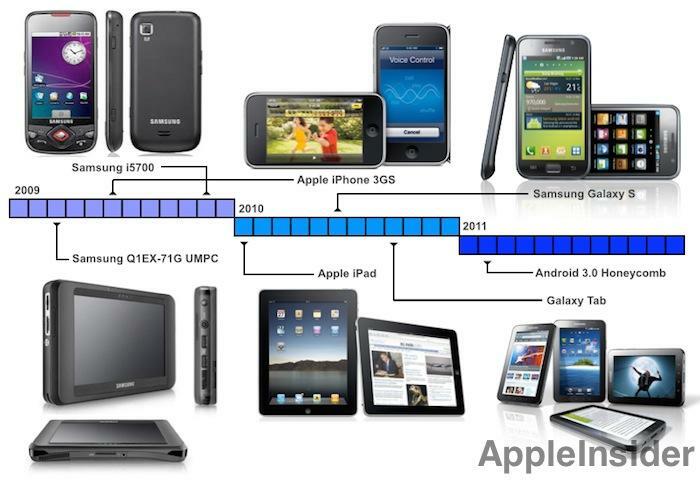 Samsung's analysis of Apple as an "extremely real and urgent" threat and the company's clear understanding of what Apple would release in 2012 and how well it expected iPhone 5 to perform through 2013 is the complete opposite of what the tech media was reporting about Apple throughout 2012 and into 2013. Instead, industry reporters described iPhone 5 as being a disappointing product and characterized its record setting launch as being disappointing sales, while Apple itself was repeatedly written about as being a ghost of its former self and "not innovative enough." Samsung's response to the innovative threat it saw in Apple's continually improving and strongly profitable, high demand iPhone was simply "continuous" advertising of its own Galaxy brand. "Galaxy," which was originally Samsung's brand for iPhone-class premium devices originally styled upon Apple's iPhone and iPad designs, should be repurposed to "brand more handsets," Samsung detailed in the document. "Galaxy S for premium models, Galaxy for other high/mid tier smartphones." Samsung also released very low-end Galaxy Y "mass market" phones with anemic specifications that make it hard to still call it a "smartphone." 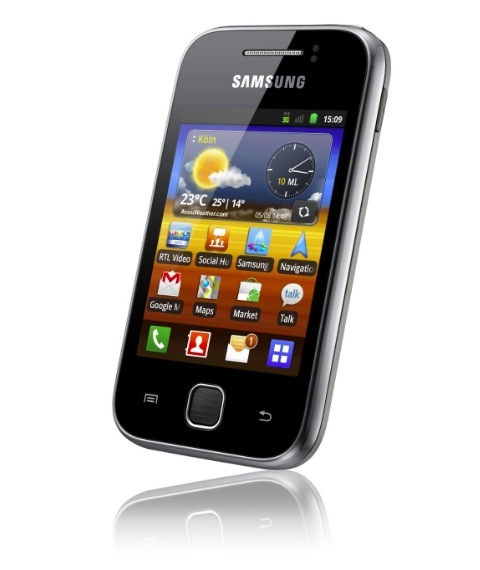 The 3G-only Android 2.x Galaxy Y incorporates an ARMv6 chip, 290MB of RAM, a 2MP camera and a 3 inch, 240x320 screen, hardware specs inferior to Apple's iPhone 3G from 2008. Despite popular reporting that seemed to portray Samsung as being a favorite brand, the company itself revealed that during the release-year of iPhone 5, Samsung's higher end phone sales flattened out, while its volume unit sales growth same mostly from "mass market" models like the cheap, very low end Galaxy Y.
Samsung also detailed a strategy of "continuous" branding campaigns where "Galaxy Nexus rolls into Galaxy Note into GSIII," playing upon Apple's consistent branding of iPhone across generations of its products. "Drive consumer pull," Samsung's Galaxy branding document strategized, hoping that "customers walk into stores asking for Samsung." To get there, Samsung said it needed to "understand why customers buy Apple," and then "develop countermeasures by carrier/retail." Samsung also set a goal to "maintain retail positioning on premium handsets (increase marketing investment)." Despite a very expensive branding effort in 2012 and 2013 however, Samsung's share of premium handsets has come primarily at the expense of other Android makers. Apple sold over 150 million iPhones in 2013, compared to two-thirds as many premium handsets shipped by Samsung. Even Apple's iPhone 5c, which has been broadly mocked as a flop by the media, managed to significantly outsell Samsung's high end flagship Galaxy S 4 model during the critical holiday sales season. Despite being the world's largest Android licensee and the only other significantly profitable phone maker outside of Apple, Samsung recognized that 80 percent of its product portfolio needed to serve the needs of carriers, while only 20 percent of its phones could serve Samsung's own initiatives. "Request carrier support for 20% of roadmap (i.e. GSIII and special Samsung projects such as Galaxy Note)," Samsung's strategy document outlined. Further, despite the obviousness of this strategy, Samsung was able to coax bloggers and mainstream media sources to report the opposite of what was happening, seeding the idea that Apple was no longer an innovative threat, that customers were choosing the high end experience offered by Samsung, and even that Samsung had the capability to offer whatever "special" products it could develop without regard for the carriers who sold its products.